"Climate change is one of the greatest challenges of our time. We (the parties) emphasize our strong political will to urgently combat climate change in accordance with the principle of common but differentiated responsibilities and respective capabilities. To achieve the ultimate objective of the Convention to stabilize greenhouse gas concentration in the atmosphere at a level that would prevent dangerous anthropogenic interference with the climate system, we shall, recognizing the scientific view that the increase in global temperature should be below 2 degrees Celsius, on the basis of equity and in the context of sustainable development, enhance our long-term cooperative action to combat climate change." One objective from the Convention is to stabilize greenhouse gas concentration in the atmosphere, preventing dangerous anthropogenic interference with the climate system. From Manabe (1983) we have: "In the strictest sense, current concern about global climate change refers to the anticipated altering of temperature and precipitation resulting from the anthropogenically induced accumulation of greenhouse gases. Greenhouse gases, which include water vapor, carbon dioxide (CO2), methane (CH4), nitrous oxide (N2O), tropospheric ozone (O3) and chlorofluorocarbons (CFCs), are relatively transparent to incoming solar radiation but absorb outgoing infrared radiation emitted from the Earth's surface. All else being equal, increasing concentrations of these gases will cause temperatures to rise at the surface of the Earth." A graphic depicting greenhouse gas concentrations is seen here: EPA Climate Change Web site . The EPA states: "Atmospheric concentrations of greenhouse gases are affected by the total amount of greenhouse gases emitted to and removed from the atmosphere around the world over time." The previous link shows a breakdown of global anthropogenic greenhouse gas emissions by each gas measured on a CO2-equivalent basis. Since industrialization began 150 years ago, the levels of several important greenhouse gas levels have increased approximately 25 percent. We can attribute 75 percent of human-made carbon dioxide emissions to burning fossil fuels during the past 20 years. The movement of carbon among the atmosphere, land and oceans is dominated by natural processes referred to as the Carbon Cycle. These natural processes can only absorb part of the net 6.1 billion metric tons of anthropogenic carbon dioxide emissions produced each year, with an estimated 3.2 billion metric tons added to the atmosphere annually. Some suggest we may have to purposely sequester carbon dioxide to keep atmospheric concentrations manageable. Carbon sequestration is a geoengineering technique and is defined as the process of removing carbon from the atmosphere and depositing it in a reservoir. Your ESS firm has been approached by the Executive Secretary of the United Nations Framework Convention on Climate Change (UNFCCC) to address the issue of anthropogenic increases in atmospheric carbon dioxide and its role in climate. Earth systems science scrutiny should illuminate the causes and impacts of increased atmospheric carbon dioxide on the Earth's spheres. The United States is one of the largest emitters of carbon dioxide. In the U.S., greenhouse gas emissions come mostly from energy use. These are driven largely by economic growth, fuel used for electricity generation, and weather patterns affecting heating and cooling needs. Energy-related carbon dioxide emissions, resulting from petroleum and natural gas, represent 82 percent of total U.S. human-made greenhouse gas emissions. You and other ESS specialists have been asked to assist the U.S in meeting the agreed upon CO2 targets of the Copenhagen Accord by developing a carbon sequestration strategy. Manabe, S. 1983. Carbon dioxide and climatic change, p. 39-82. In: B. Saltzman (ed.). Theory of climate. Academic Press, New York. The carbon dioxide data on Mauna Loa constitute the longest record of direct measurements of CO2 in the atmosphere. They were started by C. David Keeling of the Scripps Institution of Oceanography in March of 1958 at a facility of the National Oceanic and Atmospheric Administration (Keeling, 1976). 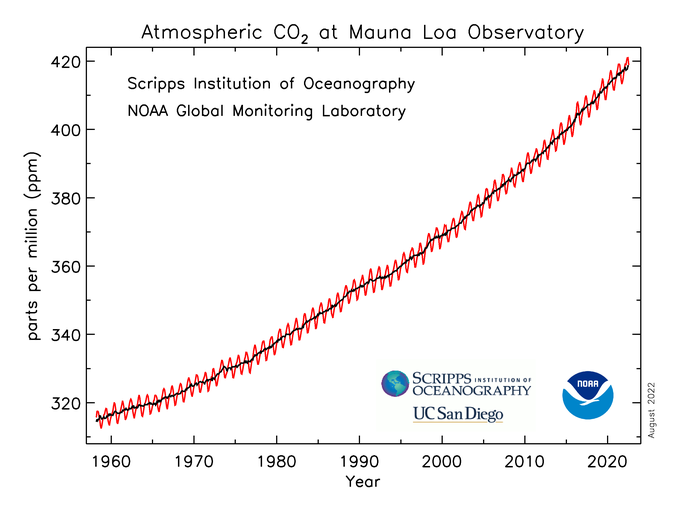 NOAA started its own CO2 measurements in May of 1974, and they have run in parallel with those made by Scripps since then (Thoning, 1989). These carbon tracker animations from NOAA show how carbon transport can be affected by weather. The tracker also shows how carbon dioxide emitted in one area, such as the United States, can reach other continents in a couple of weeks. The following links describe global warming and changes we can make to reduce the production of excess carbon dioxide. View the public briefing video on the reports issued by the National Research Council, which describe the impact of increases in atmospheric carbon dioxide and the effect on climate. The National Research Council emphasized the importance U.S.A. should place on reducing greenhouse gas emissions and developing a national strategy to address impacts of climate change. The GLOBE Student Climate Research Campaign is a program designed to engage students from around the world in investigating and researching their local climate and sharing their findings globally. The Student Climate Research Campaign will officially launch September 1, 2011 and conclude June 30, 2013. An international research symposium highlighting student climate research will occur in June 2013. To meet the terms of the Copenhagen Accord, many countries including the U.S.are taking steps to reduce dangerous anthropogenic increases in atmospheric carbon dioxide through carbon sequestration. To meet the Copenhagen Accord agreements on reductions of global warming gases, some countries including the U.S. are sequestering carbon dioxide in stable geologic formations. Nature uses trees, oceans, and decaying life returning carbon dioxide to the earth. Safe sequestration of carbon dioxide by natural or artificial means requires careful planning and research. Carbon dioxide can be reduced by natural means: reduce energy consumption, select renewable energy resources like solar and wind energy, and plant trees to absorb excess carbon dioxide produced by burning fossil fuels and other anthropogenic means. Another method for carbon sequestration involves the use of soil sequestration in cropland, degraded wetland and marshland, and reclaimed mining land. The following links provide information on reducing carbon dioxide using natural methods like planting trees and saving energy. The Development Phase builds on the information generated in the Characterization and Validation Phases and involves the injection of 1 million tons or more of CO2 by each RCSP into regionally significant geologic formations of different depositional environments. These large-volume injection tests are designed to demonstrate that CO2 storage sites have the potential to store regional CO2 emissions safely, permanently, and economically for hundreds of years. Children can learn how making small changes can impact global climate change and reduce global warming. Select one method of reducing CO2 and other global warming gases. Prepare a one-page letter to local, state, or federal representatives or senators or business owners requesting a mini-grant to fund implementation at a local school or community center. Select one of the methods of sequestration and prepare a presentation for your classmates as a proponent for the selected method in a panel discussion. After the completion of the panel discussion, prepare a one-page brief or short five-minute video for a local press release. Include in the presentation and press release a summary of local efforts to reduce global warming through carbon sequestration. Carbon sequestration means capturing carbon dioxide (CO2) from the atmosphere or capturing anthropogenic (human) CO2 from large-scale stationary sources like power plants before it is released to the atmosphere. Once captured, the CO2 gas (or the carbon portion of the CO2) is put into long-term storage. CO2 sequestration has the potential to significantly reduce the level of carbon that occurs in the atmosphere as CO2 and to reduce the release of CO2 to the atmosphere from major stationary human sources, including power plants and refineries. WESTCARB is characterizing the extent and capacity of geologic formations capable of storing CO2, known as "sinks." Results are entered into a geographic information system (GIS) database, along with the location of major CO2-emitting point sources in each WESTCARB state, enabling researchers and the public to gauge the proximity of candidate CO2 storage sites to emission sources and the feasibility of linking them via pipelines. On the basis of results from regional CO2 sequestration projects, regional research groups are now validating results from various models of sequestration. Select one method of sequestration used in your region. Prepare a one-page brief or short five-minute video for a local press release. Include in the presentation and press release a summary of local efforts to reduce global warming through carbon sequestration by injecting CO2 into suitable geologic formations. We produce more carbon dioxide from burning fossil fuels like coal and gas than many other people in the world. Carbon dioxide easily absorbs energy from the sun and contributes to global warming. Trees, oceans, and decaying life can remove extra carbon dioxide from the atmosphere. You can plant trees to remove extra carbon dioxide from the air. If you plant a garden, you can grow part of your own food during the summer. When you grow your own food in the summer, you save the fuel it would take to truck food to your grocery store. Visit the following websites to learn how to reduce global warming by saving energy and planting trees. Write a one-page letter to the local newspaper with your plan for reducing global warming by removing extra carbon dioxide from the air. Develop a one-page plan to reduce CO2 emissions using a technique used in your state/region. Include a reason for your recommendation of using the selected technique. Prepare a presentation from your one-page plan suitable for use in a local, town-hall meeting on global warming (15 slides maximum). A central goal is to demonstrate methods suitable for carbon dioxide sequestration in various regions of the US that can scale up for safe and permanent solutions to anthropogenic sources of excess CO2 and other gases that contribute to global warming. Examine results from current pilot projects underway in your region. Select one method of sequestration and prepare a poster to be presented at a local rally for environmental education. Include evidence and support from the pilot data for your selection of this model. Write a one-page flyer on reducing global warming to be distributed in the community. Include local community projects designed to save energy and reduce local warming.